The Pelicam databank of project transformation has identified the key roles involved in change and key messages- and problems - regarding stakeholder engagement, based on our real-world experience of delivering more than 200 change initiatives. Sponsor: has authority and accountability for “implementation”. Has sanctioning power over targets. Agent: responsible for planning and executing the implementation on behalf of a sponsor – prepares the people for the solution. Influencer: doesn’t have responsibility or authority but is able to persuade or influence people’s views about the solution. Often an informal or thought leader. Target: the people who will have to use the solution and modify behaviour. Everyone can be considered a target initially. The most crucial is the relationship between the Sponsor and the Agent. The Sponsor needs to keep senior stakeholders onside, while engaging with Targets and removing any roadblocks along the way. Whereas, the Agent is the prime organiser of change, responsible for project planning, governance and reporting. So, what does poor stakeholder engagement look like? If the boss supports the change, the troops will follow. The Pelicam tried and tested stakeholder engagement process is far too in-depth and multi-faceted to explain fully here, but it is essential to understand some of the key methodology. We would seek to understand where resistance can present itself and then get all stakeholders and their teams fully involved. So, find out where and why there maybe disillusionment and disengagement festering before you deal with the reasons behind their lack of support. Finally, honest and open two-way communication is essential throughout the project and organisation. Great stakeholder engagement doesn’t just happen by chance and just about every project will follow a complex route before arriving at its successful conclusion. That’s why regular monitoring and reviewing is essential. Demand a lot from your stakeholders but understand that stakeholders have the right to be demanding too. 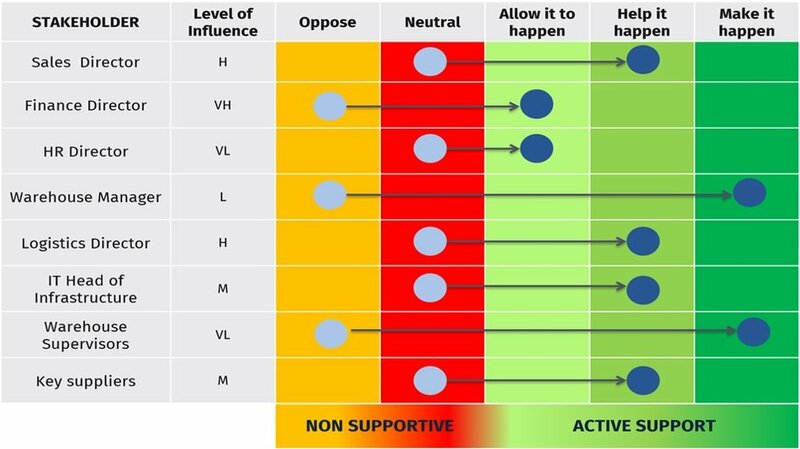 Whether you have five stakeholders or 5,000, plotting where their position on the field of play is important to ensure the successful delivery of your change programme. Disillusionment and disengagement can quickly kill a project, so apply football rules to get all the players onside! Here at Pelicam, we don’t rely on theory and surveys – our approach is defined by our practical experience and knowledge gained from hundreds of successful change programmes. That’s why our clients have learned to have complete confidence in our project assurance and delivery methods.